This post is part of a series on my visit to Changdeokgung palace on the last day of my holiday in Korea during October 2009. If you haven't read the first part, that's here: Korea day 7 part 1 - Walk up Donhwamun-ro. The top half of the western side of Gwolnaegaksa is separated from the bottom by a medium sized gate called Unhanmun (Hangeul: 운한문; Hanja: 雲漢門). 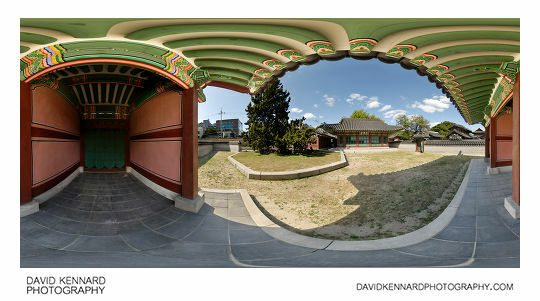 I took the above panorama under the gate, you can see the 360° VR version here: Changdeokgung palace – Unhanmun and Bongmodang 360 VR. From here you can also see the 750 year old Chinese Juniper tree, and the building up ahead is Bongmodang (Hangeul: 봉모당; Hanja: 奉謨堂). Bongmodang was the Hall of Upholding the Policies of Former Kings, where documents relating to the former rulers of the Joseon dynasty were kept. To the left of Bongmodang is a building called Chaekgo (Hangeul: 책고; Hanja: 冊庫), a building where various books were kept. This area was obviously quite book-heavy, as to the south of Unhanmun is Gyujanggak (not visible in the above photo), which was the royal library. 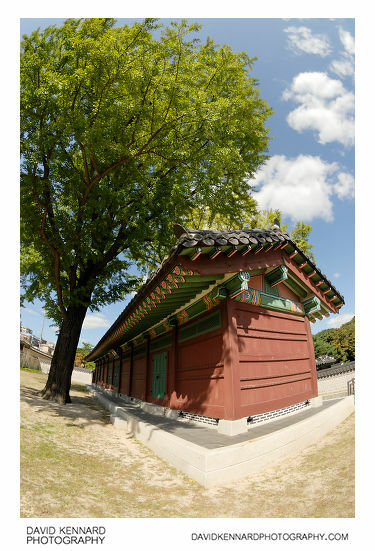 To the north of these buildings is a long building, also called Chaekgo (Hangeul: 책고; Hanja: 冊庫), and again used for storing books (Chaekgo means book library / repository). Many of the links to external sites such as Amazon etc. I use on this blog are affiliate links. This means I earn a commission if you buy something through the link.